Any device that can display text on a screen may act as an e-book reader, but specialised e-book reader designs may optimise portability, readability (especially in sunlight), and battery life for this purpose. A single e-book reader is capable of holding the digital equivalent of hundreds of printed texts with no added bulk or measurable mass. 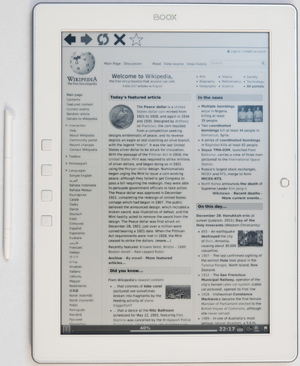 An e-book reader is similar in form to a tablet computer. 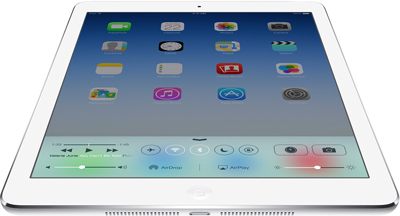 A tablet computer typically has a faster screen capable of higher refresh rates which makes it more suitable for interaction. Tablet computers also are more versatile, allowing one to consume multiple types of content, as well as create it. The main advantages of e-book readers are better readability of their screens, especially in bright sunlight, and longer battery life. This is achieved by using electronic paper technology to display content to readers. 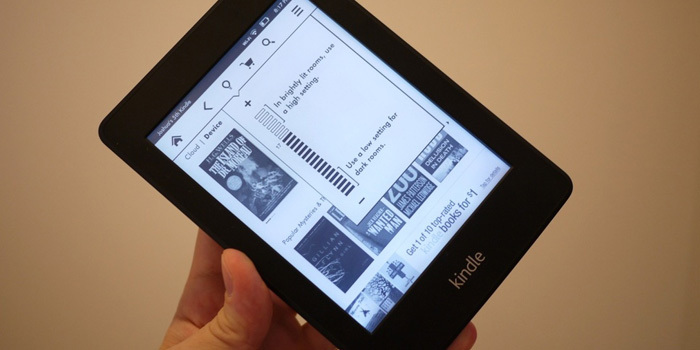 5 Can't-Miss Tips and Tricks for That New Amazon Kindle You Just Got - TIME Magazine. 9 THINGS YOU DIDN'T KNOW YOU COULD DO WITH YOUR AMAZON KINDLE - Wired. Adobe READER - "Free PDF viewer download." After a decade of resisting, I finally bought a Kindle - The Verge. Amazon Kindle Oasis review: the luxury e-reader really is something special - The Guardian. AMAZON KINDLE PAPERWHITE (2018) REVIEW: THE NEW BEST-SELLER - "Just add water(proofing)." Amazon Kindle Paperwhite 2018 review: the new standard - "Refined design, water resistance and good screen makes latest e-reader about as good as a single-use device gets." Amazon's cheapest Kindle now has a better screen and a front light - "Higher contrast, better touchscreen and Paperwhite-like light among improvements." Are Audiobooks As Good For You As Reading? Here’s What Experts Say - TIME Magazine. COMPARISON OF E-BOOK READERS - Wikipedia. HOW TECHNOLOGY SHAPES THE WAY WE READ - "The State of Reading: A Wired Investigation." Keeping Notes & Highlights From Kindle Books - The New York Times. KINDLE CHANGED THE BOOK BUSINESS. CAN IT CHANGE BOOKS? - Wired. Kindle Oasis review: The Kindle you want, but not the one you buy - The Verge. Kindle Oasis review: The oasis is the best kindle you can buy - until the next one - Wired. Kindle Oasis review: The perfect e-reader for the 1 percent - engadget. Lucrin - founded in Switzerland in 1994. "Handmade by our finest leather craftsmen, our Kindle sleeves boast of a wide array of customization options which you can not find anywhere else." 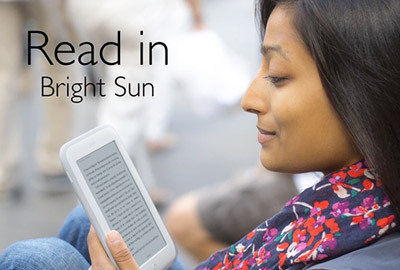 Nook GlowLight 3 is better suited for night-time reading - engadget. The best eBook readers & Kindles you can buy - The Telegraph. THE DIGITAL READER - "Read More, Carry Less." News, review & opinion blog. This is what a 16th century e-reader looked like - europeana. ASUS EEE READER DR900 - "The world's first 9-inch touch screen eBook reader." CYBOOK Ocean - "An elegant design for a larger scale of reading." CYBOOK Odyssey - "With the High Speed Ink System, Bookeen invents the fast e-ink." 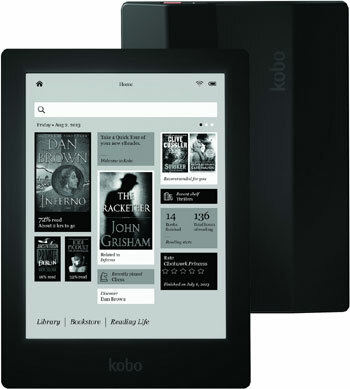 500EB Black - 5" Colour eBook Reader. ELONEX 621EB - 6" eInk eBook Reader. ELONEX 705EB - "Say Hello to Colour." enTourage eDGe - the world's first dual panel personal device, combining a tablet on one screen and an e-book on the other. jetBook Color eTextbook Tablet - the world's first to utilize eye-friendly Color E Ink technology in an eTextbook Tablet oriented solely towards education. KINDLE COVERS & CASES - Amazon.com. Kobo Aura HD - "The eReader, re-imagined." NOOK - by Barnes & Noble. All models. NOOK GLOWLIGHT - "Our Best Reading Experience Yet." Onyx Boox - all models. Onyx Boox M92 - 9.7 inch Large e-ink screen 1200×825 pix. PocketBook Touch Lux - limited edition. "Designed to admire." SAMSUNG Readers Hub - "Turn your mobile into a library." SONY READERS - all models. 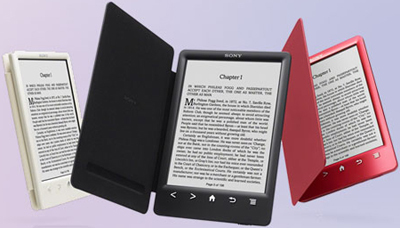 SONY READER PRS-T3 - "A slimmer, lighter e-Reader with integrated snap cover and high resolution screen."